Under sink water heaters allow getting acquainted with many advantages and very ideal for home uses. And these do not require a lot of space. They are compact, electric and a small point of use – water heaters. So logically saying, since these water heaters are compact in size, under sink water heaters are not an alternate of full house tankless water heaters. They are the point of use of tank-based waters. These products are capable of providing an adequate amount of water for kitchen applications or hand washing. 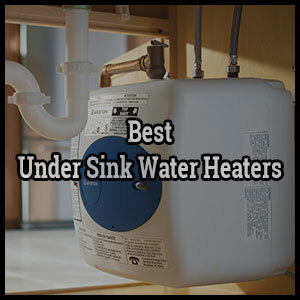 But as the water usage amount varies from people to people, choosing the Best Under Sink Water Heaters effectively is really important. They are also very ideal for camps and cottages too. Electric mini-tank water heaters help to save electricity and water if you are concerned about so. Plus one point to that. Installing a mini-tank water heater under your sink is always a big convenience. Ariston GL4S is not apart from that. It will allow you to have hot water at the point of use. 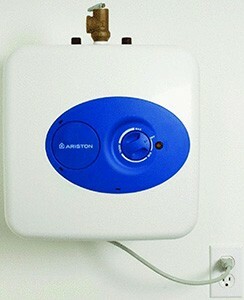 Point-of-use application: This electric mini-tank water heater can be put right where you want it. You can install this heater for the point of use purpose and this amazing water heater will provide you with hot water in your desired location. No hard-wiring required: Another amazing feature of this unit is that you do not need any hard wiring for the installation of the heater. You can simply plug it into an outlet and the heater will run automatically. Sleek and compact design: This is a mini-tank water heater, weighing only 17 pounds. Despite the fact, it can store 4 gallons of water, which is a lot. It easily fits right under the sink, thus allowing easy access to the controls. The water tank is glass-lined, meaning that it is not prone to corrode or rust. It will last for a long time. Temperature adjustment knob: Unlike the older GL4 series, the Ariston GL4S has improved the temperature adjustment knob. It allows you to increase or decrease in temperature from 65 degrees Fahrenheit to 145 degrees Fahrenheit. Cons: The small tank only holds a small quantity of water. This means that if you need to clean a large pile of dishes, the hot water will quickly run out, leaving you a bit frustrated. It can help you save water and electricity, compared to using traditional tanks heaters, which consume more electricity and waste water by letting it run until warms up Installing a mini-tank water heater under your sink is always a big convenience. Ariston GL4S is not apart from that. It will allow you to have hot water at the point of use. This particular brand comes in 3 different sizes and can be wall hung or floor mounted. Also, it is possible to install them in-line with a larger hot water source to help minimize the wait for hot water. Sleek and attractive design: This amazing water heater very compact in size and weighs only 17.3 pounds. This heater can either be wall-hung or floor-mounted – according to your wish. 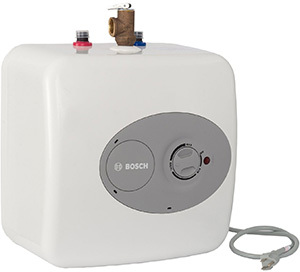 Glass-lined tank: Unlike most traditional tank-type and tankless water heaters, Bosch Tronic 3000 T uses the glass-lined tank. This amazing feature gives the heater a longer life and prevents corrosion. The heater also has a fast recovery rate for an instant supply of hot water. Different configuration: This heater can be used for different purposes. This heater can be used as an addition to a primary water heating source. It can also be used as a buffer for a tankless water heater. But the most important feature of the heater is that it can be used as a sole water heating system as well. Cons: Since the unit’s tank is small in size, it is not very ideal in situations where you need to clean a lot of dishes. Immediately the tank empties, the unit will run out of hot water. The unit helps save water because it allows instant access to hot water instead of having to run the water for a few minutes until it becomes hot enough. Installing this mini-tank water heater under your sink helps save water because you will no longer have to run the water for more than a couple of minutes until it gets heated up. In addition to eliminating the wait for hot water, you can also increase the water volume by hooking the unit in-line with a large water source. Pressure Relief Valve: This valve ensures maximum safety for the water heater. The excess pressure of the water may cause the water heater to underperform. The pressure relief valve prevents that kind of damage from happening. Point of Use applications: This water heater is amazing for point of use application. If your need for hot water is relatively lower, then this is the right water heater for you. Appliance line cord included: Ecosmart ECO MINI 2.5 comes with an appliance line cord. Therefore, it becomes easy for you to install the heater. Cons: Some customers have complained that it overheats easily. No others found yet. It is an amazing water heater for those who do not need very large tank water heaters. Saving Time: An Under sink water heater undoubtedly helps save a lot of your time. Instead of waiting for water to heat up or wasting your time while awaiting heated water to be delivered to you from a conventional water heater situated at a distance through circulation lines, you can get hot water instantly and save a lot of your time. Saving Water: Using a point of use water heater can help you save thousands of gallons of water every year. This is because you don’t need to run the water until it gets heated up for you to start using it. Instead, using an electric mini-tank water heater will enable you to get hot water instantly, thus saving a lot of water which would otherwise be wasted because of the delay between turning on the faucet and getting hot water. Very Convenient For People Who Live In Big Houses: For those people who live in big houses with a central water heating system, it takes quite some time for delivery of heated water to distant outlets can take a very long time, causing a lot of inconveniences. Also, if you have a remote sink within your house that is not served by a tankless or tank-type water heater, installing a mini tank water heater can be a most convenient way to help eliminate waiting time as well as avoiding water wastage. Cost Effectiveness: Mini tank water heaters are reasonably priced considering the period they can serve you. They also help reduce energy consumption and are easy to maintain. # Type of fuel: You can purchase a water heater that runs on electricity, propane, or natural gas. Buy one that uses the most economical and convenient fuel for you. # Volume: If a point-of-use water heater is your primary source of hot water, you should consider POU water heater. Then you need to buy a brand that can be hooked up in- line with a traditional tank or tankless heater, That means it will enable you to get enough hot water all the time but at a single point of usage. # Requirements: Also, the unit will require specific installation requirements. Therefore, you should consider things like voltage requirements of your desired unit and whether your home can accommodate that. Other important things to consider include amperage and circuit breaker. It is important to ensure that the type of mini-tank water heater you intend to buy can work with the amperage draw and circuit breaker that you have at home. # Ratings: There are two important ratings that you need to consider when buying a mini tank water heater. The first one is the energy factor (EF), which tells you how efficient the heater is. The higher the number, the more efficient the pump is. The second one is the flow rate. For the mini tank water heater, you can choose the flow rate of your choice depending on your specific needs. # Easy to install: It is always good to buy a product that you can be able to install easily by yourself without involving other people. Therefore, choose a mini tank water heater that is easy to install. Mini tank water heaters are undoubtedly associated with many advantages and are therefore a smart choice for you. They are cost effective since they help in saving energy and water. They also save extra installation expenses that are associated with pumps and long pipes. Also, they are easy to maintain and are reasonably priced considering the duration of time they can serve you. 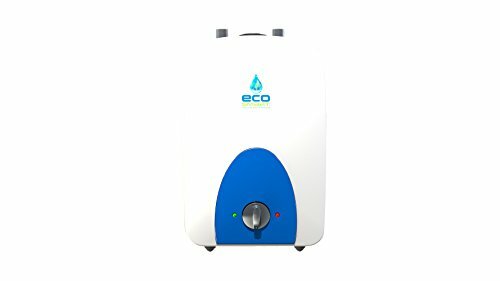 Essentially, electric mini-tank water heaters give value for money and therefore you should plan to buy one for yourself and enjoy some of their advantages. Want to buy one for yourself but can’t decide which one? Feel free to contact us and we are ready to assist you. Great article…..I really appreciate your post as it is so informative…. These are all pretty helpful tips so thanks a lot for sharing!!! !Nice information that you shared with us….Keep posting…..I’d love top read your blog….Have a nice day ahead!!!! Thanks Nils for the nice feedback. Stay in touch for the latest updates. For more information please read our blogs. Nothing has been said about piping the pressure relief valve. Where is the the discharge of water from these heaters when the relief valve opens?